For a start, those giant white letters can start dancing around rather alarmingly if you are sleep deprived and have gone a bit stir-crazy in a Boeing 747 Jumbo Jet all the way from London, before flying over them from a great height. Text ballet aside, the purpose of my trip was twofold. I was there to explore the art world, discovering as much as I could from big museum spaces to creative crevices, but I was also there to give LA a taste of London. The Los Angeles art scene is really thriving, with a great number of intensely artistic hubs and innovative galleries, as well as fantastic collections housed in The Getty Center, the Los Angeles County Art Museum and theMuseum of Contemporary Art. I was part of a team of artists curating and exhibiting in Los Angeles – including the talented painter Abigail Box whos work can be found on London’s trendy Vyner Street; and Kimi Wylde, a controversial artist who plays with the archetypal characters within in society through her portrayals of herself in her photography. The exhibition was part of a brand new art event called FLAG STOP which involved some of LA’s leading artists, curators and art industry heavyweights. 13 diverse and exciting London artists were selected. Currently represented by Notting Hill based gallery Debut Contemporary, the artists have all successfully shown in top locations such as The Venice Biennale , Tate Britain and Tate Modern, with work recently auctioned by high profile Christies auctioneer Hugh Edmeades. Collectors of their work exist in many countries and include Banksy and Bill Woodrow. Together the 13 artists formed a ‘micro-gallery’ that brought a slice of London to LA. So how did we end up in LA? After causing a stir in West London, we were selected to be part of FLAG STOP. Existing somewhere between a pop up exhibition, an art fair and a festival, FLAG STOP presents emerging contemporary art to a larger audience outside the mainstream art venues – drawing the big players to it instead of going to them. FLAG STOP exhibitions were curated and selected by some art ‘grand fromages’ including Howard Fox (emeritus Curator of Contemporary Art, LA County Museum of Art), William Moreno (curator & director of William Moreno Contemporary LA, LACE board member), Scott Canty (Director/Curator of the Los Angeles Municipal Art Gallery) and Lily Siegel (of The Museum of Contemporary Art, otherwise known as MOCA). For them the opportunity was about adapting and changing to work within new and alternative spaces, as well as questioning the notion of the audience – coming out of the big ‘white cube’ spaces meant that a lot of perceived barriers could dissipate. For our part in FLAG STOP, instead of a static, white-wall gallery, we decided to take a different path. We knew we would be attracting people from all walks of life, from big name art visionaries to those who had never experienced art before. The 13 artists have all been part of art events which play out as ‘social experiments’ back in London, so we decided to build on our experience and provide an interactive, performative space. The walls were left raw with a salon style approach which formed our ‘pick and mix warehouse’ area and captured the organic, festival-like qualities of FLAG STOP. A ‘white square’ on the far wall became our ‘visitor curated space’. Gallery visitors were asked to pick works to place together in the white square, engaging in a dialogue about contemporary art. The artists had a glorious time chatting away to visitors and rearranging the space whilst talking about the art of their fellow contemporaries. The white square space was ever evolving. So how did the people react? Whilst some have their own objectives on how to peruse an art gallery, many were not shy about getting involved. There were strong links between our way of working and the seminal “I am a curator” exhibition at Chisenhale Gallery, about which I have written before. It’s time to get inspired by the surreal and ambiguous whimsy of daydreams…Wonder, like curiosity, can make seemingly impossible things happen. Below, some of the conversations and connections are pulled together to help your imagination traverse the micro-gallery, and the observations and talks that occurred within it. The first vision to draw visitors into the gallery is Vikram Kushwah’s haunting photography. He challenges the notion of reality through his work and impresses that “It’s time to get inspired by the surreal and ambiguous whimsy of daydreams…Wonder, like curiosity, can make seemingly impossible things happen.” Kushwah’s helium suspended figure in ‘Ofelea and the Flying Balloons’ (pictured above) perplexed and intrigued many with it’s inherent but unknown narrative. 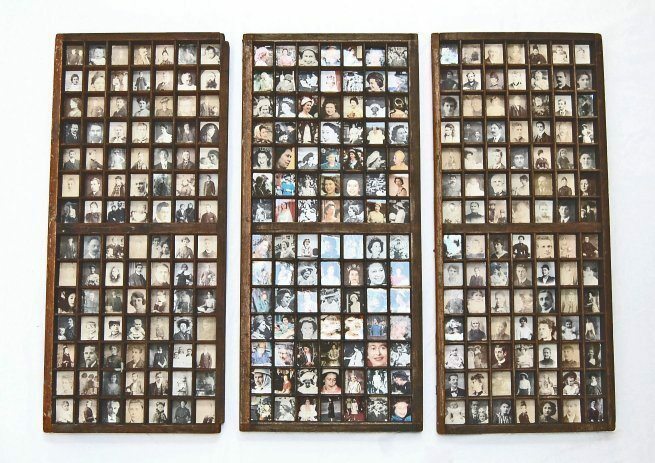 Notions of recollection and collection are strong in both Powell’s piece and also Nicola Anthony’s text artwork, ‘Mneme’ which depicts a woman who’s portrait is rendered entirely using a date stamp – representing the collective moments, fragments and memories which come together to make us who we are. Both pieces reference history, personal memory and connotation. Sylvia Morgado is also a text artist, dealing with work that explores fragments through the associations we have with language. 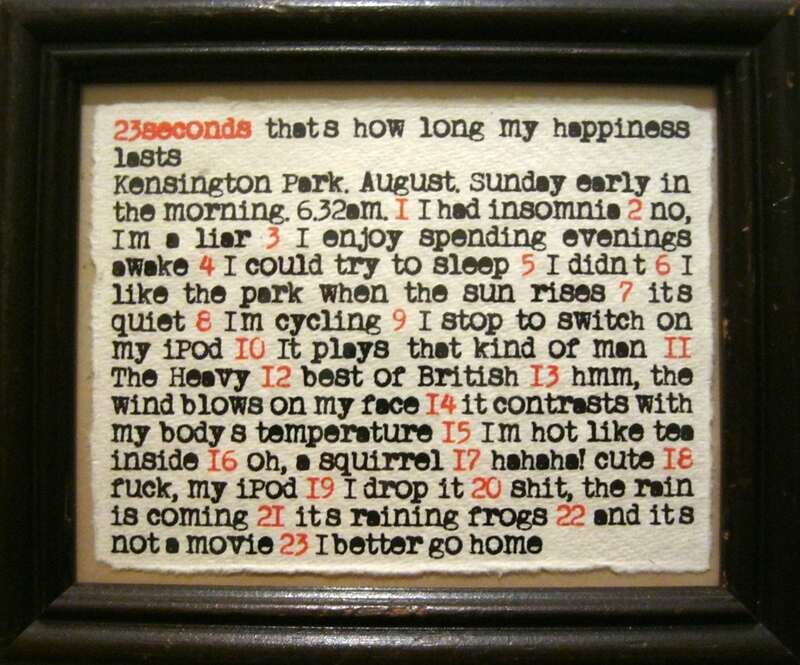 Her work, ‘23seconds’ is a collection of 23 short stories told in 23 parts, and hangs in pockets around the space. It was inspired by British artist Richard Hamilton’s “Swingeing London” in which he creates multiple paintings and drawings from a single photograph. Visitors enjoyed the playfulness of this piece and quite often hung it at jaunty angles. Gallery visitors also suggested Morgado’s seconds and Anthony’s dates could be count downs or expiration dates, reading the artworks as a comment on the fragility of life. Viewers also touched upon notions of ‘throw away culture’ which arose from Twinkle Troughton’s work. 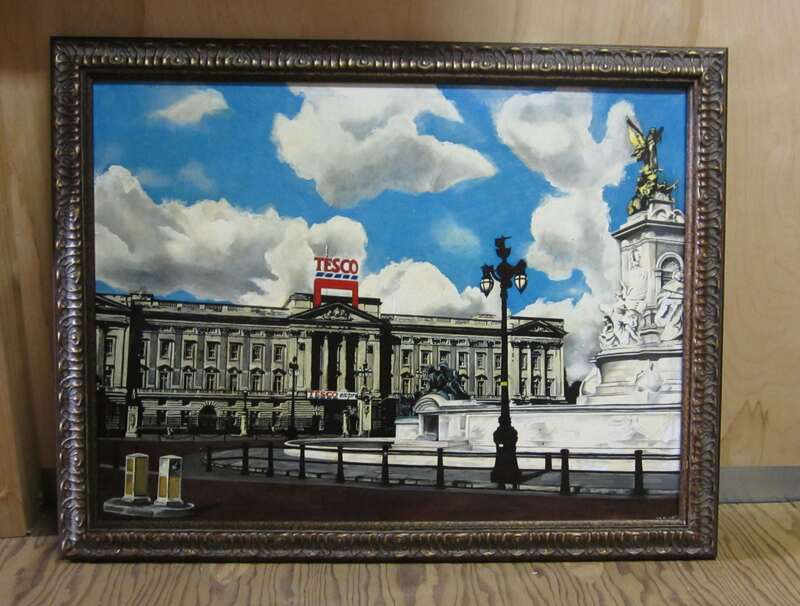 Her painting featured Buckingham palace adorned with a Tescos logo. Her satirical style can be bold or subtle, often with dark undertones, combining politics with matters of the heart. She has been described by London Metro as ‘entertainingly derisive and unforgiving’. ‘Tescingham palace’ was made when Twinkle discovered that more people have stepped into Tescos than churches in recent years. Her questioning of our cultural habits and values certainly prompted some comments about shopping as the new religion, and what the Tescos brand represents to the UK compared to their equivalent USA brand, ‘Fresh and Easy’. (Although many Americans seemed baffled by the idea of microwave meals, as the US is full of great take out. To be fair, I think most English people are baffled by today’s supermarket shelves, where the word ‘finest’ has been reappropriated to mean ‘edible’). Twinkle’s other controversial piece “The Secret of England’s Greatness” began to form a dialogue with Wylde’s posed portraits. In both pieces, consumer culture and the pop art genre are taken to extremes. Kimi Wylde’s ‘Oh Jeff I love you too but’ references Lichtenstein, and also toys with her own image, allowing her to question her own self portrayal. In contrast there is a distinct willingness to tell the story of others rather than their own in the work of both Azadeh Fatehrad, and the photographer Katrina James who’s makes beautiful images which capture her subjects off guard with a raw energy, emotion and humanity. A dichotomy through raw ‘underground’ and glamorized fashion scenes appears in her work. James’ elegant but, on closer inspection, intriguingly awkwardly posed women in ‘Favela’, (above top), and Wylde’s melodramatic females (above, shown with artist) were curated alongside Darren Macpherson’s provocative lady. Three very different portrayals of the female form. Macpherson’s painting is figurative and abstract (pictured above), with high key colours he has somehow achieved a mixture of tribal, graffiti, and grace. Come close and you will see he spends a lot of time building up layers of colour and background, before working quickly with paint straight from the tube “until the work itself lets me know that it is complete”, in the artist’s words. Robert West’s artwork speaks a divergent painterly language, and was placed alongside Abigail Box’s lion-sized painting, ‘Between You and I’, exploring their differing gestures and exploration of space. Box’s paintings present an awkward yet familiar scenario with their introduction of wild animals into domestic spaces, whilst playing with the way space is rendered. In her talks to the gallery audience she explained how the paintings are initially born as a collaged piece before being painted, adding to the lion’s slightly ‘out of place’ but simultaneously right-at-home contentment. Themes of altering or questioning perceptions ran through a lot of the exhibited work, as well as the notions of text, history and unknowing. 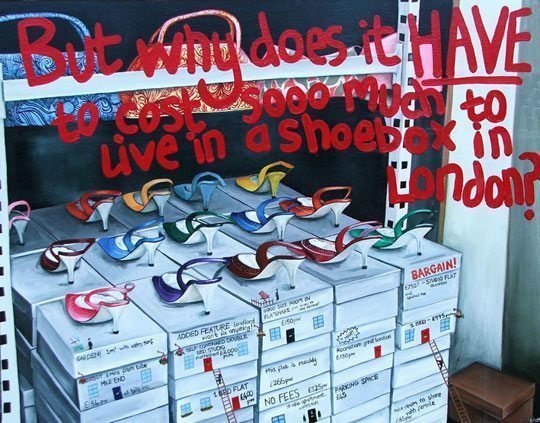 Yet another use of the written word appears in ‘Shoebox’ by Tinsel Edwards, a piece which speaks of the housing situation in London. As an artist with both Banksy and Saatchi buying her art, her work combines bold text and imagery, using slogans and anecdotes as an ongoing personal narrative describing the world as she sees it. Her work poses questions and offers challenging commentary on a variety of social, political and cultural observations. By now your mind should have envisaged a full circuit of the micro-gallery. Of course this is all just a taster of this London showcase in LA, and to say that the UK art scene caused a splash stateside is an understatement – the ripples are still crossing the ocean as you read these words. With new exhibitions being announced for these talented and ambitious London artists including the Orange County Centre for Contemporary Art (OCCCA), this is a “fascinating case of a real advance being made in the art world, and the arrival of an innovative, ambitious, driven collective of artists to keep an eye on.” With many other events now planned and an array of ‘pop up’ exhibitions, exchange exhibitions, and specific connections as a result, there is a growing reciprocal relationship between the LA and London scenes. The fantastic thing about the FLAG STOP show is that it was all achieved with very little money, no major financial sponsors, but just the pure passion for art and the ceaseless drive of creatives. 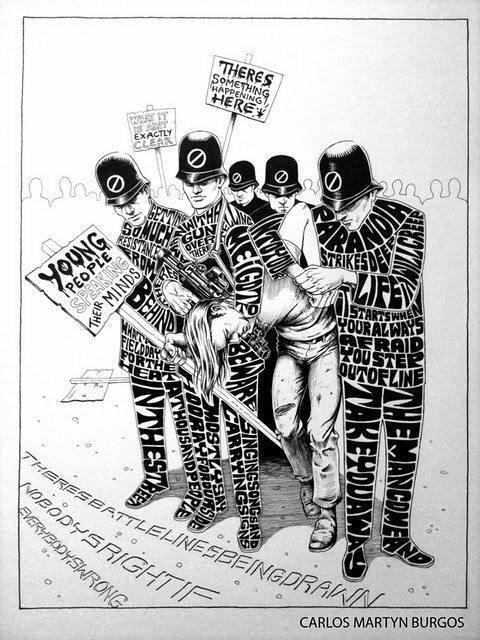 As an event which challenged the system, it resulted in something fascinating and engaging. During a speech at the event, Michael Fox noted that “in western culture we ascribe a dangerous level of authority to museums and news networks, we look to them for validation, but this exhibition has only served to highlight that art exists regardless of whether it is being shown in a big institution like LACMA or Tate”. The present is a time when artists have again abandoned the system, they are looking for new ways to immerse the world in art, and it is a very exciting time indeed. Whilst my recent trip focused on the art scene, I also threw in a smattering of donuts, an introduction to the REAL taco, a number of meetings with fascinating people, as well as a midnight dip in the Pacific ocean – and I have to admit, LA knocked my socks off. In the coming weeks I will be interviewing and writing about all the inspiring figures I met in Los Angeles, squeezing in all the insight and inspirations that I was – and continue to be – exposed to via my new conversational friend, LA.